Consider the function and look at what it does to values on the circle . and as we go around the circle once, we see that ranges from to . Note also that has a zero of order 3 at the origin and That is NOT a coincidence. Now consider the function and look at what it does to values on the circle . and as we go around the circle once, we see that ranges from to . And here, has a pole of order 3 at the origin. This too, is not a coincidence. Here is what is going on: you might have been tempted to think and this almost works; remember that switches values abruptly along a ray from the origin that follows the negative real axis..and any version of the argument function must do so from SOME ray from the origin. The real part of the integral (the part) cancels out when one goes around the curve. The argument part (the imaginary part) does not; in fact we pick up a value of every time we cross that given ray from the origin and in the case of we cross that ray 3 times. This is the argument principle in action. Now of course, this principle can work in the vicinity of any isolated singularity or zero or along a curve that avoids singularities and zeros but encloses a finite number of them. The mathematical machinery we develop will help us with this concept. So, let’s suppose that has a zero of order at . This means that where and is analytic on some open disk about . This leads to the following result: let be analytic on some open set containing a piecewise smooth simple closed curve and analytic on the region bounded by the curve as well, except for a finite number of poles. Also suppose that has no zeros on the curve. Then where are the orders of the zeros of inside of and are the orders of the poles of inside . Now this NOT the main use of this result; the main use is to describe the argument principle and to get to Rouche’s Theorem which, in turn, can be used to deduce facts about the zeros of an analytic function. Argument principle: our discussion about integrating around a closed curve (assuming that the said curve runs through no zeros of and encloses a finite number of poles ) shows that, as we traverse the curve, the argument of the function changes by where the zeros and poles are counted with multiplicities. Example: consider the function . Let’s find how many zeros it has in the first quadrant. If we consider the quarter circle of very large radius (that stays in the first quadrant and is large enough to enclose all first quadrant zeros) and note we see that the argument changes by about . 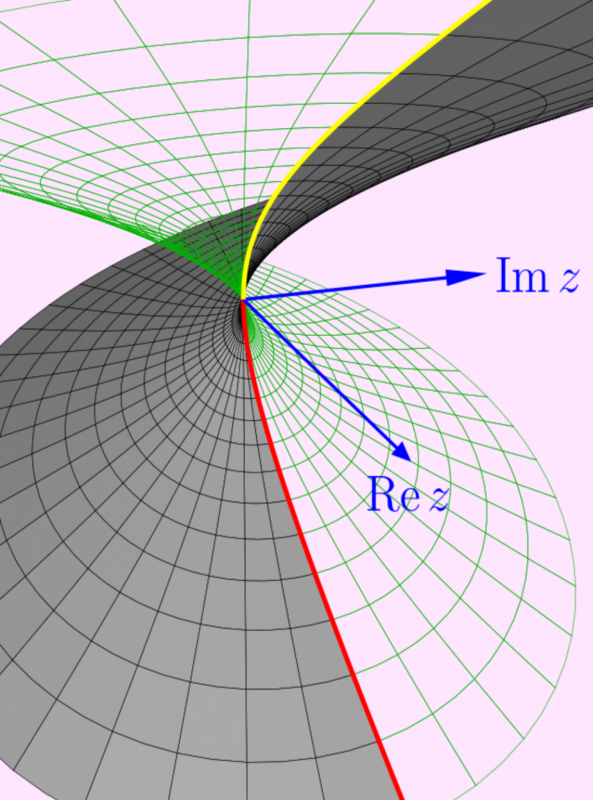 The function has no roots along the positive real axis. Now setting to run along the positive imaginary axis we get which is positive for large , has one relative minimum at which yields a positive number, and is zero at . So the argument stays at so, we get which means that we have 2 roots in the first quadrant. In fact, you can find an online calculator which estimates them here. Here is Rouche’s Theorem: let be analytic on some piecewise smooth closed curve and on the region that encloses. Suppose that, on we have . Then have the same number of zeros inside . Note: the inequality precludes from having a zero on and we can assume that have no common zeros, for if they do, we can “cancel them out” by, say, writing at the common zeros. So now, on we have which means that the values of the new function lie within the circle in the domain space. This means that the argument of has to always lie between and This means that the argument cannot change by so, up to multiplicity, the number of zeros and poles of must be equal. But the poles come from the zeros of the denominator and the zeros come from the zeros of the numerator. And note: once again, what happens on the boundary of a region (the region bounded by the closed curve) determines what happens INSIDE the curve.